Funny that it is beginning to seem like one day on my great American roadtrip requires one week in the real world for me to get it written, photos & video put together, etc. Some days were so heavy on photos, that it is a major time commitment. 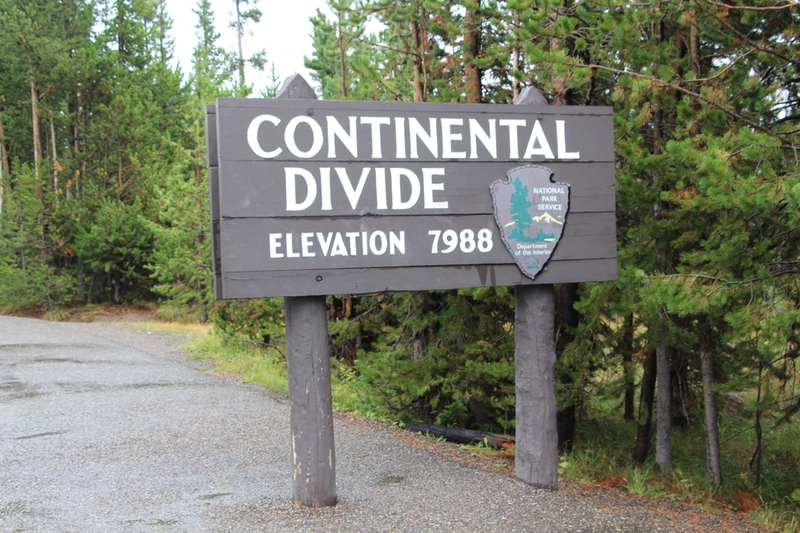 It should be no surprise that would be the case from a day’s visit to two of the leading national parks — Grand Teton National Park and Yellowstone National Park. But that’s exactly what I did but I’ll break it into two posts. 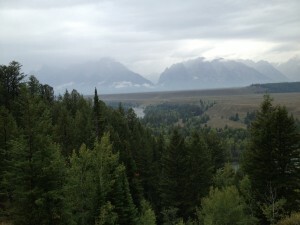 First the overview and Grand Teton, next Yellowstone. Here are a few of the stops I’d like to highlight here, but if you see anything in the video that I didn’t mention, please feel free to ask! I had driven up to Dubois, WY for the night in order to get within a stone’s throw of the Grand Teton National Park. Having driven along the Wind River for a while on Sunday, I was happy to see a really good turnout for scenery. It was really beautiful, the pine trees, mountains, river & ground cover…. great time to stop on the side of the road. It also made me feel a little sassy. So I got my trip-pod out to take some decent photos while I was there. I did okay but have to admit, I enjoyed the silly picture as much as anything. The video includes the more scenic shots and video though. It seems a travesty to spend one day in two such incredible parks. On the other hand, it would have been equally horrible to go all that way and not see the parks at all! I saw so much in a single day, that I was overwhelmed as I looked through photos and video. I hope if you go, you have longer to enjoy each of these areas and sights, but if not, know now you can have one helluva day there even if the weather seems a bit crappy! The video below provides highlights of the scenery and the wildlife I saw throughout the day…. maybe I made the most of the one day because I didn’t have any time to waste! Both parks offer some great turnouts all along the way, so while I spent a lot of time driving, I had lots of chances to hop out of the car quickly, snap a few pics and then hop back to get on my way. Each of them had boards to help place what you were seeing into context — history, geology, general chemistry, etc. It was a chance to learn a lot! And I had the chance to cross the Continental Divide several times. I relied less on things I had read or seen and more on the experts in the parks once I got well into the day. The ranger working the gate at Grand Teton, ranger at the Yellowstone gate, those working the various welcome and visitor’s centers, etc. With the fact that it was really cool and raining off and on, I wasn’t sure whether I wanted to drive south from Moran into the heart of Grand Teton. I mean, I could just brush through the northern part of it and get to Yellowstone, maybe even get to Bozeman early enough for dinner. Well, I decided to take the long way. 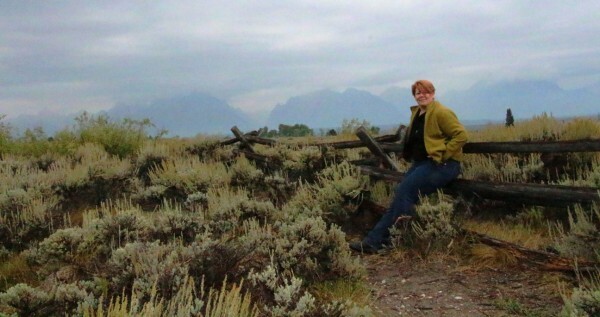 I had the chance to see a ranch that is inside the park…. I love knowing that families who were ranching that land before the idea of preserving it as a park have the ability to continue ranching. I got the tripod out again and took some more photos. I really like this self-portrait too! Some folks replied both on Facebook & Twitter suggesting they had, asking what it was, etc but I was keeping this trip on the downlow so I was pretty vague with my replies. I did email my mom, sisters and brothers the true wow moment! Check this out! Total wow. That photo is from my iPhone too! I got some even better ones with my Canon. And I’m so pumped that I shot some video! 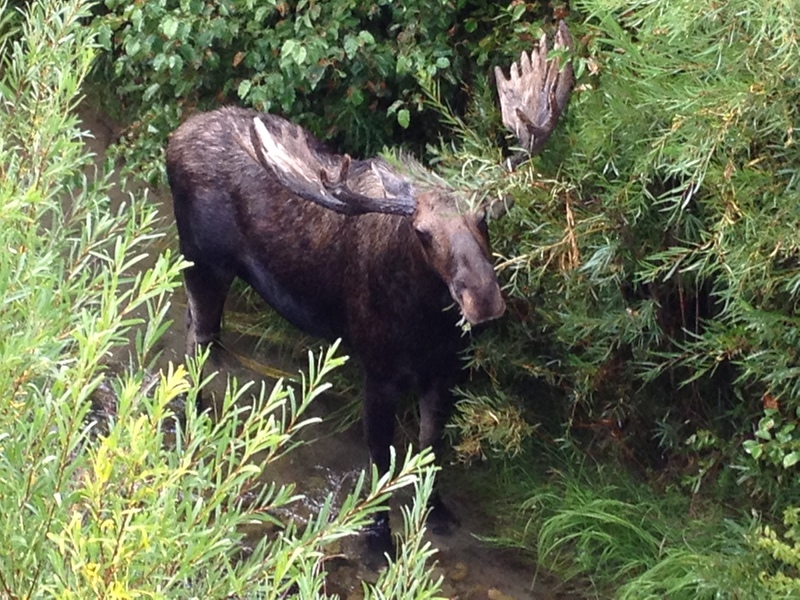 You can see some of it in the video overview of my trip through Grand Teton & Yellowstone (embedded below) but for moose-loving friends, I also decided to post the raw footage of the moose eating to my YouTube account. With that experience, I was certain that it didn’t matter what time I got to Bozeman. 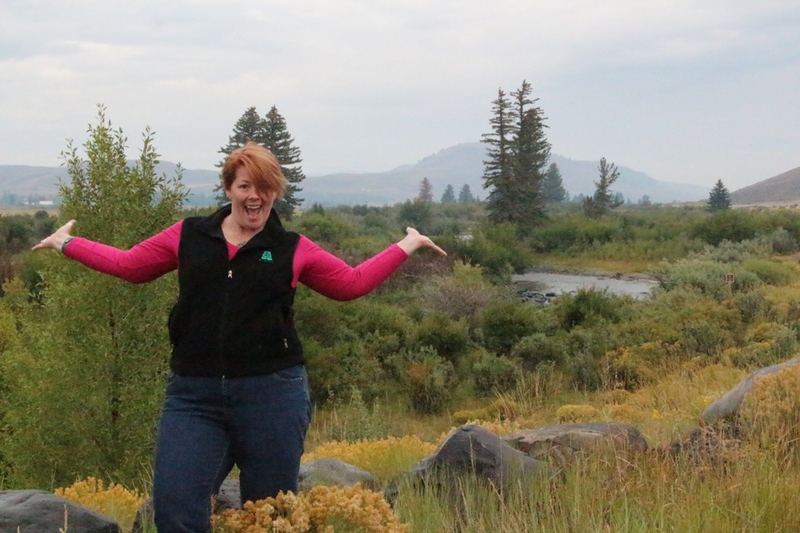 I also realized that I had cut into time to spend in Yellowstone but the impromptu experiences…. those are the things you can’t recreate. And as I worked my way north, the clouds began breaking up a bit more here & there & temps warmed too! 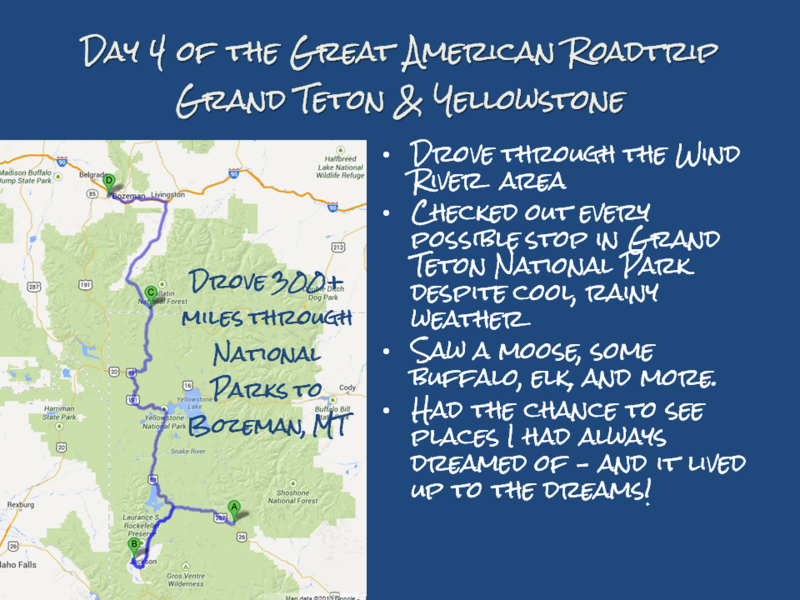 I know I wrote this post to be about both the Grand Teton and Yellowstone but this has gone so long, that I have decided to make it work in two parts. 🙂 The same video will just go on both posts since I’m too lazy to redo it!